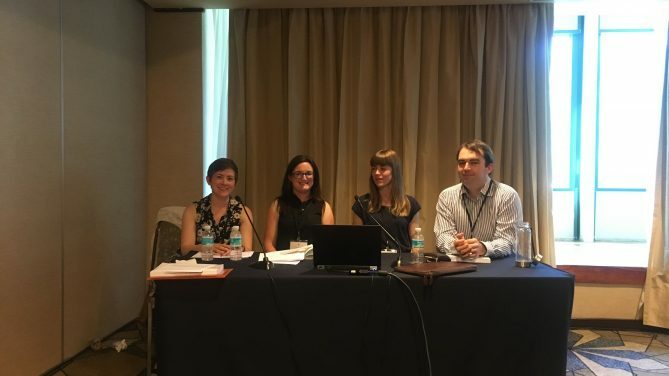 Dr. Cheryl Lawther and Dr. Lauren Dempster recently presented papers at the Law and Society Association’s annual conference in Mexico City, which ran 20th-23rd June. Dr. Cheryl Lawther (second from left) and Dr. Lauren Dempster (left) presenting at the Law and Society Association conference with Dr Rachel Killean and Dr Luke Moffett. Cheryl convened the panel on ‘Voice, Agency and Responsibility: Victims and Transitional Justice,’ and Cheryl and Lauren were joined by Dr. Rachel Killean (QUB) and Dr. Luke Moffett (QUB). Copies of Cheryl and Lauren’s papers/slides are available on request via the ‘Get in Touch’ link at the bottom of this page.